Lavender Hills release their new single Who’s Talking? On 25th January via Animal Farm. Lavender Hills are a South London rock’n’roll band formed by Luke Speirs, Beaumont Chivers, Joe Gunstone and Adrian Morat in late 2016, Lavender Hills are steeped in indie rock, riff-driven alternative sounds, funky soul and a dash of humour. The band rehearse in an underground studio on Lavender Hill. One evening, a one-eyed drunk burst in, demanding a guest spot with the “Lavender Hills mob”. “Driving indie rock that nods to Arctic Monkeys and Biffy Clyro.” – Bugbear Bookings Releasing their first EP, the well-received ‘Hands Down Now EP’, in April 2017, the band embarked on a heavy gigging campaign to promote the EP and built up their hard-core following, the ‘Lavender Hill Mob’ or ‘The Lavs’. 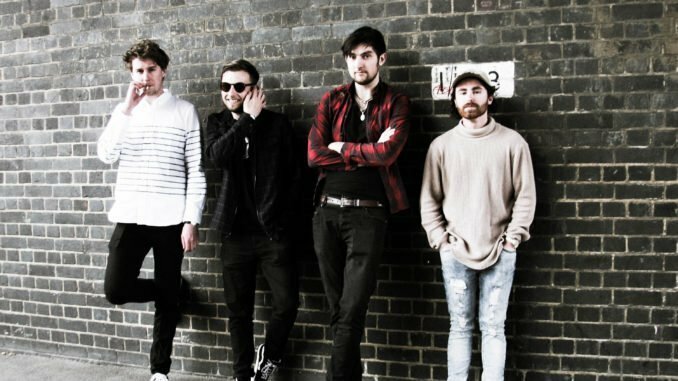 Throughout 2017, they played a succession of London venues including 93 Feet east, The Dublin Castle, Proud Camden, Spice of Life, Camden Assembly (Barfly), Water Rats and a prestigious gig at Brixton JAMM supporting Frankie & The Heartstrings. Who’s Talking? by Lavender Hills is rambunctious South London rock at its best. Lavender Hills release their new single Who’s Talking? On 25th January via Animal Farm. Loving these boys groove. Check out their Spotify.. however Their online releases only scratch the surface of their live set where Every song is a minor classic ! Go and see them in action.